This is the last post in the Kickstart Your Japanese series. 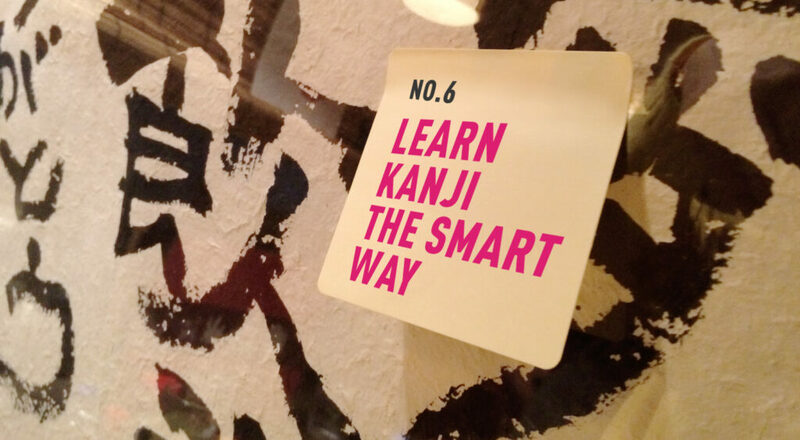 Until now we’ve focused on strategies that create the right environment for your Japanese to flourish, and a couple of specific learning strategies, but we haven’t touched on the big one… kanji. It’s not necessary to learn kanji to speak Japanese to a good level, but there comes a point at which not being able to read without furigana seriously limits the amount of input you can get. There are hundreds of books available on learning kanji and dozens of suggested methods. I don’t believe there’s a best way to learn kanji, so I’m going to give you the approach that worked for me and explain why I think it’s a good one. You can decide whether to take it or leave it! There’s no way around it – learning Chinese characters is a huge task that requires regular effort and commitment. As a result, the temptation to look for shortcuts is massive. In my opinion, that’s what the majority of “Learn Kanji” books, apps and commercial flashcard sets represent: shortcuts. It’s not that kanji apps or flashcard sets don’t help in some way, I just think that they miss the point. In an effort to cut out the hard work, they end up depriving you of the depth of study needed to properly tackle such a big task. If these things don’t work, what does? Decide which kanji to learn by choosing words that crop up in your reading materials (article 3), language exchanges (article 4) or other activities (article 5). Record these in your SRS app (article 2) as they come up, always in context (i.e. full sentences). Don’t try to capture everything, just things that interest you. This gives you a storage place for new kanji and a method for revising them. Buy a bunch of kana practice books from your local 100-yen store. Write out the kanji that you want to learn in your practice book a few dozen times each using a sharpened pencil. Get the stroke order right. Write out full words, not just single characters. For example: 準備 （じゅんび）rather than only準（じゅん）. Work at it every day for 30-60 minutes. Write one word out twenty times, move on to the next, then mix it up, making sure to review old words. Buy Remembering the Kanji. This book’s mnemonic devices are consistently mentioned by learners as being extremely useful in remembering characters. Use it as a resource to look up the characters you’re learning – don’t be led by the book. Get your language partner to check how you write the characters. Watching them correct the stroke order, shape and balance of your characters is a fascinating and important part of the learning process. Having tried lots of approaches, I firmly believe that systematically writing out kanji is the only way to truly learn. The intricate detail of many characters can only really be understood by having to produce it yourself – it’s too complex and detailed a task for a recognition-only system (such as flashcards) to be effective. Over time, you may find tricks that help you to learn faster and cut down the time, but start off with this system and you can be sure that you will have a firm foundation. I hope you’ve enjoyed this series and that, at the very least, you’ve been inspired to take a fresh look at your Japanese and to ask questions of your approach up until now. None of it is quick or easy, and there’s a lot of hard work involved. Play the long game, resist the temptation to take shortcuts, do things the right way, and you will get there sooner than you think.